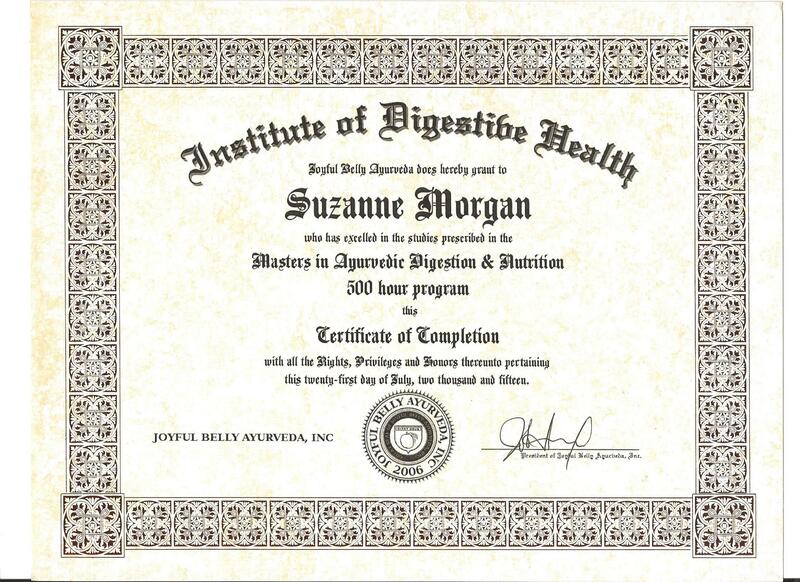 Just got my Masters in Ayurvedic Digestion & Nutrition! Woo-hoo! You may be aware that I just graduated with a Masters in Ayurvedic Digestion & Nutrition in July. I’m now a full-fledged Ayurvedic Nutrition, Lifestyle and Health Consultant. Ayurveda offers deep healing through natural methods. This new work blends perfectly in with my yoga teaching. I am madly in love with helping others find better health and happiness. Might I help you? and all digestive issues and pathologies. If you’d like a private consultation, I’m offering an introductory rate of $49 for 49 minutes. We’ll meet in person or by Skype. For more information or to schedule an appointment, email me at suzannemorganyoga@yahoo.com. This entry was posted in Uncategorized and tagged ayurveda by Suzanne Morgan. Bookmark the permalink. That’s wonderful! Congratulations! I wish I lived closer to you to attend all of your classes you offer. Big hugs to You! Oh, thanks a million Marina. I cherish your well wishes. Big hugs back! Congratulations, Suzanne! I’m certain you will blossom and grow well in this field. I wish you the best. Your clients will learn so much from you, as I did being at the OBX long ago when you helped prepare( & enjoy) such wonderful meals. Sally B., you are the nicest person ever. 🙂 How is xcdogs? What’s new with you? How is your sweet mother?